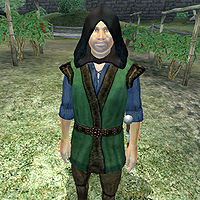 Gaston Surilie is a Breton rogue and the brother of Davide Surilie. As vintners, they are responsible for some of the most popular wines in and around Cyrodiil, the most common being the regular Surilie Brothers Wine, the rarest and most expensive being the Surilie Brothers Vintage 399. Although they are both dedicated to their craft, the Surilie Brothers’ workday depends on the weather; sunny days are busy days, while rainy days are spent inside the house. Gaston sleeps behind one of the reinforced doors on the top floor every night between midnight and 6am. While Davide leaves for work right away, Gaston waits an hour before he goes to work at 7am. The Surilie vineyard is located in the West Weald, just west of town and Gaston spends the entire morning working the land amidst all the grape vines. At 1pm he finds himself an available chair near the vineyard and enjoys a two-hour lunch. At 3pm he reenters Skingrad and works in his own backyard along with Ambroise Canne. At 8pm he will stop working and just hang out in the backyard until he goes inside at 11pm. On rainy days, he will stay inside the house all day long, eating lunch at 1pm as usual. The only exception to his daily routine can happen during the Paranoia quest, but only if you deem his brother guilty in conspiring against local town eccentric Glarthir. If you show either Gaston or Davide the List of Death, both Surilie Brothers will set off at a running pace, seek out Glarthir regardless of his location, and kill him on the spot. Gaston is one of only three Cyrodiil citizens who wears the zero-weight black hood. He also wears a blue & green outfit and a pair of thick cowhide shoes. In combat he will use the shortsword of sparks, an enchanted iron shortsword. Gaston carries his copy of the house key, a hoe, a rake, and a moderately sized amount of gold. He knows a set of leveled rogue spells. When you approach the busy vintner for the first time, he will introduce himself: "I'm Gaston Surilie. Perhaps you've met my brother, Davide? Together, we are the Surilie Brothers Winery." When asked about Skingrad, a proud Gaston will reply: "Skingrad is the wine-producing capital of Tamriel. You must sample our local wines. You'll never taste better. The 415 vintages were particularly good. The 399... well... a once-in-a-lifetime experience... IF you can find a bottle."